A Charlie Brown Thanksgiving…Lunch Anyone? Last year my husband and I decided it was time to start our own little family traditions. Thanksgiving was the perfect test holiday. The toughest part was planning the meal. My husband decided he would tackle the cooking since my skills are less than satisfying in the kitchen. Washing dishes is my kryptonite, so I set out to find another way to help that did not involve setting off the smoke alarms or getting my hands wet. After burning my brain cells trying to think of ways to contribute, I started to think about all the things we do on Thanksgiving. While my son sleeps, the night before Thanksgiving, the Christmas tree, all the decorations and the Christmas movies magically appear in our living room. When my son wakes up on Thanksgiving Day, he is excited to see that Santa brought the tree and movies from the North Pole. We turn on the Macy’s Thanksgiving Day Parade and after it’s over with, usually around lunch time, we watch A Charlie Brown Thanksgiving. (BINGO! A light came on and my brain kicked in. We could have a Charlie Brown Thanksgiving for lunch. “What a brilliant idea!” I thought to myself. I immediately sat down and watched the classic TV special to get the menu. In A Charlie Brown Thanksgiving, Charlie Brown served his friends two slices of buttered toast, some pretzel sticks, a handful of popcorn and a few jelly beans. To drink I figured they probably had some fruit punch or water. Snoopy set it all up on a ping pong table with mismatched chairs. Since I was lacking in the correct table attire, I decided our card table and chairs were good substitutes. When I approached my husband with the idea, he looked at me like I was nuts. Let’s think about it though…A Charlie Brown Thanksgiving lunch is simple clean up, cheap and light on the stomach. I won my husband over and we decided to give it a shot. My son (five years old at the time) loved it! He had so much fun helping me do the shopping beforehand and setting the table on Thanksgiving Day. We kept with tradition and watched A Charlie Brown Thanksgiving while we ate. After lunch my son and I decorated the tree while my husband got to work on dinner. All in all it was a nice and relaxing day, one that we plan on recreating again this year. Do you have any fun Thanksgiving traditions? Share them with us in the comment section below. 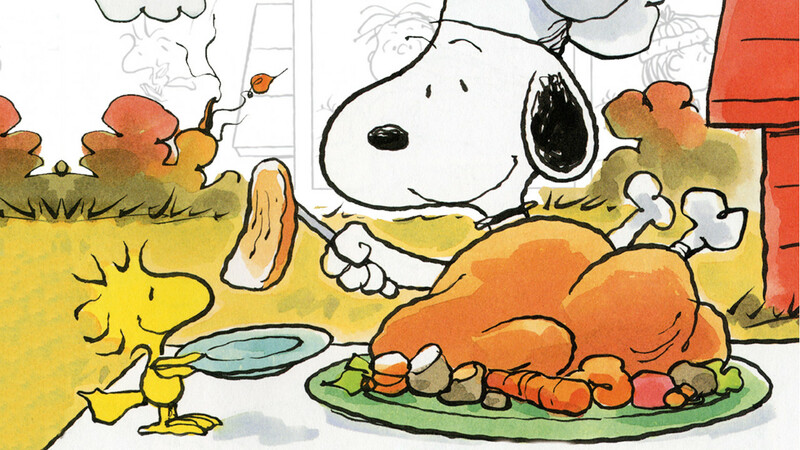 4 Responses to A Charlie Brown Thanksgiving…Lunch Anyone? I love this!!!!! We always watch Holiday Inn after thanksgiving dinner, to herald the coming of Christmas. OH MY GOSH!!! Washing dishes is my kryptonite, too! I feel your pain. Unfortunately, I also love to cook… So my kitchen is fully of dirty dishes all the time! Sigh. One of our traditions is to watch the Charlie Brown Thanksgiving special and the Mayflower one. We have them on DVD. We also watch the parade, but that is usually more for me as the cousins would rather play. We also go to our family’s farm and go deer hunting every year. Oh dear. Washing dishes is my wife’s Kryptonite, too. Thankfully, we have not yet done a big dinner at our new house. (We shall have do to some very creative planning if we ever do.) Normally, it’s with her folks, but not this year– it will be with mine. TV will be on our own time– too much chaos during an extended family get together. Oops. No television. No Netflix. Hmm… YouTube or Hulu it is, probably.